Wadi Bani Khalid is another must-see stop we planned to check off on this road trip. This particular canyon should probably be pictured in the "oasis" entry in the encyclopedia; date palms and other flora surround deep emerald pools within the protective grasp of large rock walls and boulders. The wadi becomes even more visually appealing further inside the canyon walls where the water flow has cut deep, narrow and impossibly clear pools in the rock bed. We found Wadi Bani Khalid to be a most refreshing detour and one of those places where it is impossible to take a bad photograph. Exhilarated by our idyllic dip in the wadi, we headed towards our accommodation for the evening, Safari Desert Camp, deep within the Wahiba Sands. We checked in at the camp's office in Bidiyah (a town right outside the sands) where they deflated our tires to ensure better traction on the 10+ mile drive through the desert to camp itself. Having already had the experience of being rescued by a group of friendly Omanis after lodging our car in the sand trying to find a camp site on the beach just the night before, we were both pretty apprehensive about this drive. However, our 4x4 proved its capabilities as we aggressively surfed the hills and valleys on this well packed desert track, and our nerves gave way to enjoyment on one of the most exciting drives we'd ever taken. 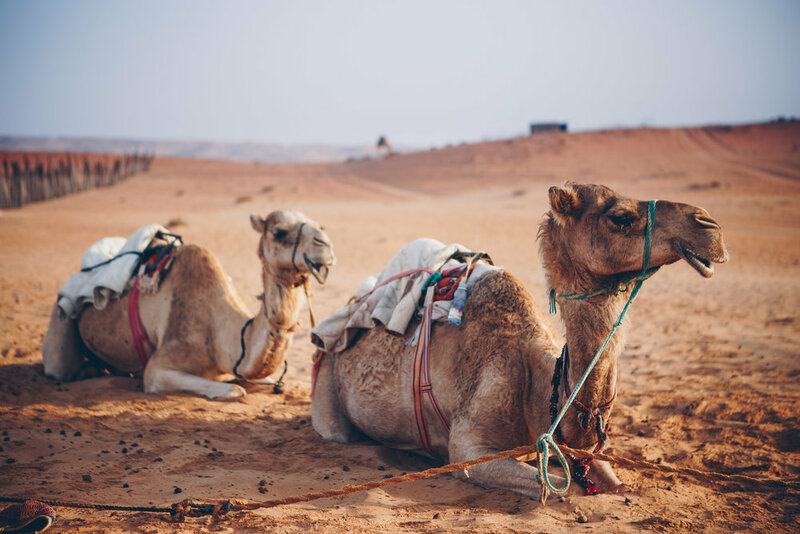 We arrived at the camp's picturesque group of tents and modest buildings nestled between sky-high sand dunes, and were greeted with omani coffee and dates. We quickly settled into our cute Bedouin styled room with an attached open-air bathroom, and then headed out on a camel ride to catch the sun setting over the dunes behind the camp.